It looks like the Football Association is poised to appoint the wrong man to manage the England football team. 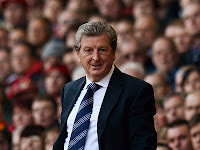 There may be good reasons why the FA has approached Roy Hodgson and not the fans n' pundits' favourite Harry Rednapp - probably because he'll come a lot cheaper being most important. Hodgson has the international experience which Rednapp lacks and apart from his disastrous stay at Liverpool his League cv stacks up pretty well, although he has nothing to compare with the near-miracle Rednapp has performed at Spurs. England's football stars have a bad habit of not delivering when representing their country; the ability and application they show week in, week out for their clubs is left in the dressing room. For whatever reason - perhaps the bolshie Old Guard or club tensions - our stars don't shine when they have Three Lions on their shirts. Hodgson will have to convince he has the strength of personality to weld our over-paid, under-achieving prima donnas into a national side to be proud of. With Harry Rednapp there would be no doubt who was boss - and the likely squad recognised this and were supporting his appointment almost to a man. Hodgson will have to prove he is equal to the task and his critics - including myself - wrong. I hope sincerely he succeeds. The FA made the correct decision.